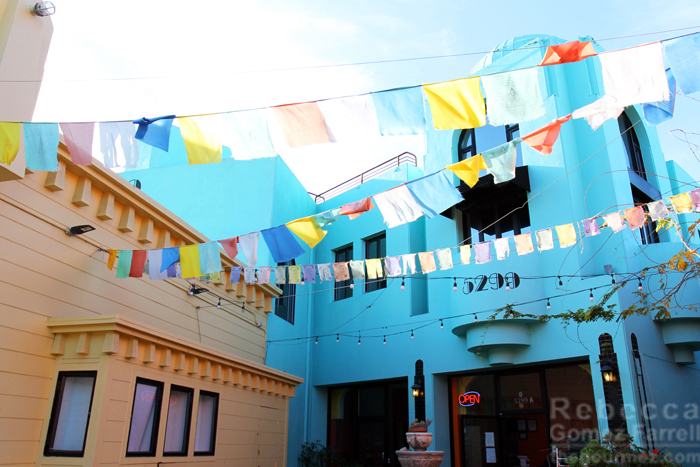 I know very little about Tibetan Buddhism, except that I love their beautiful prayer flags. Is it any wonder High Peaks Kitchen catches my eye every time I walk down College Ave? 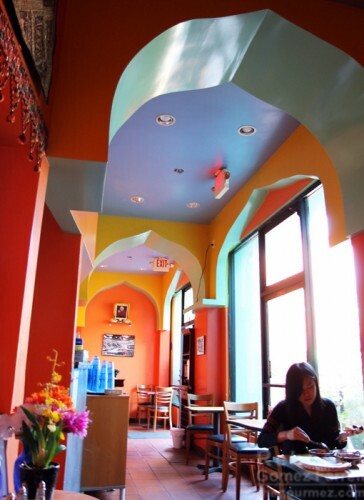 As the menu explains, High Peaks Kitchen is owned and run by Tibetan exiles who learned how to cook a diverse range of Indian food during their time in that country. Strangely, with as fresh of produce and as admirable of cooking traditions the Bay Area offers, I’ve only been blown away a few times when dining out since I moved here. So I was ready for High Peaks Kitchen’s food to fall far below the vibrant colors in pleasing me. Luckily, it did not. First, do not fear: there is seating inside as well as out for our rainy winter days. Service was slow, but for what I’m sure is primarily a take-out business, that’s not unusual, and anytime I called someone over, they got what I needed right away. Water is self-service by the kitchen. 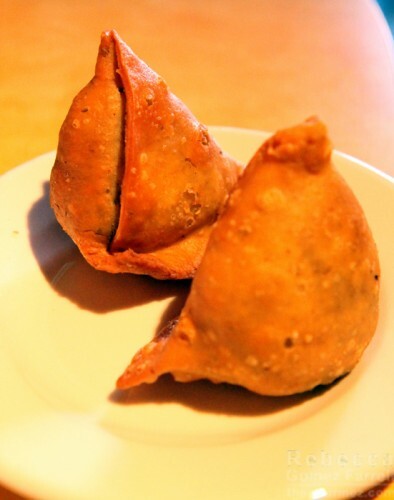 I insisted to Friend #1 that we start with an order of veggie samosas. They were among the best I’ve had. The pastry, thick and flaky, had a delightfully grainy texture with a crisp exterior. 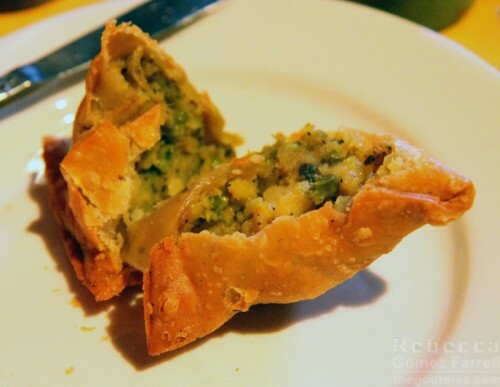 The ingredients’ quality shone through with plenty of flavor — samosas too often end up with a bland lump of filling, but I could savor and easily distinguish between the peas, potatoes, and spices. My mouth was now primed to enjoy my entrée, and it did. 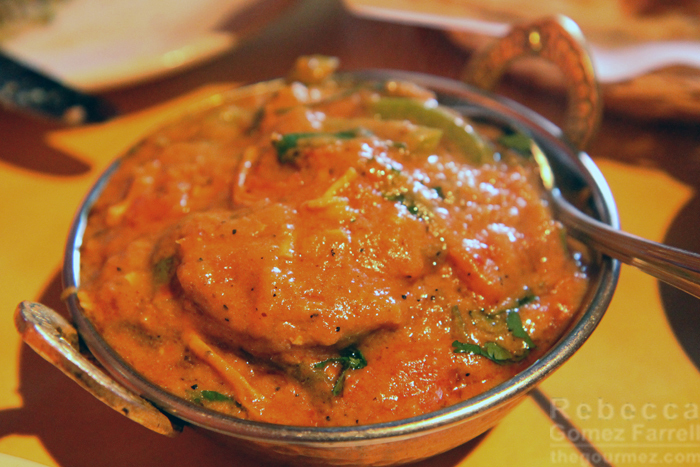 I hadn’t seen chicken jalfrezi on a menu before, which pretty much determined I would order it. The texture was that of a tomatillo salsa verde. It’s made with roasted spices and bell peppers, both green and red based on the medley of flavors. Perhaps a touch of cream jumped in as well. The chicken fell apart in that way you know it’s been cooked perfectly. Medium was plenty spicy for me, and I have a high tolerance for heat. 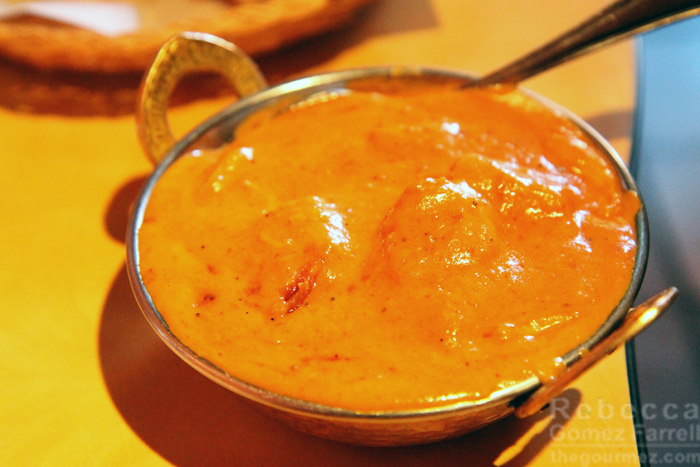 Friend #1 had the chicken korma. She thought it was great, and I’m pretty sure that’s what my husband thought of the lamb coconut dish I brought home for him — he consumed it too fast for me to get a bite! I must also give special accolades to the garlic cheese naan. I did not expect it to come out yellow from the tandoor rub or to be topped with lots of cilantro in addition to the chopped garlic. 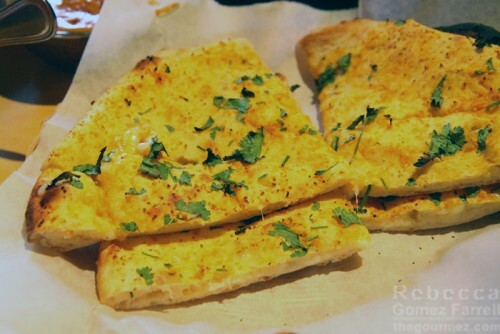 The melted cheese covered the bread well without making it greasy. It tasted fantastic, and the char from the clay oven added character. But I’m a pushover for char. I should note there’s no beef on the menu, but there are millions of vegetarian, chicken, lamb, and seafood options. A large menu can often be an indicator of a kitchen spread too thin, but High Peaks demonstrated no such shortcoming to me. I just wish it was on the northern end of Rockridge, so I could enjoy it more often. Sounds delicious! I’m such a huge fan of Indian food. This sounds amazing! Since most of their business seems to be takeout, now that you’ve been there, do you think you’re less likely to dine in? Not me! I am much more about dining out than in. Just seems more convenient to me when I’m out of the house. Of course, I work at home, so it’s a different perspective than most people’s!